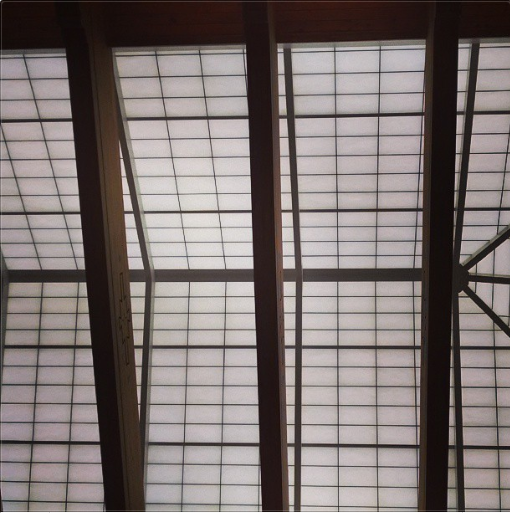 The twin skylights in the kitchen I grew up in were single-pane. Each droplet of northwest drizzle would sound like it came right through the thin sheets of glass, reverberating off the stove top, the fridge, the sponge-painted walls. When the rain came down hard, it was as if the house had rebirthed itself as a percussion instrument, or perhaps the recipient of a heavenly Swedish massage. It’s a sound I miss at school — Santa Fe isn’t exactly known for rain. But occasionally, and especially this time of year, the weather will spring a downpour upon us. If you’re lucky enough you’ll find yourself under the full glass roof of Meem Library when this happens. A couple of moments after the pitter-pat begins there’s a collective pause as everyone sets down their book for a brief moment to look up at the ceiling, to look around and at one another, silently sharing the wonder with grins across the room. And then each returns to their reading under the sound of falling water, feeling just a bit cozier than before. If you too are in need of a good hard rain, check out rainymood.com. There’s not a whole lot better than one tab playing a downpour, and another tab open to Debussy Radio on Pandora (or maybe La Femme d’Argent). Another one of my favorites is coffitivity.com. Developed out of research suggesting moderate ambient noise boosts creativity, Coffitivity plays a recording of a coffee shop. I know it sounds a bit ridiculous, but give it a try. You can even choose between different tracks like “University Undertones” and “Morning Murmurs”! Let me know if you try either out, or how you feel about the sound of rain in Meem — I know I couldn’t have spoken for everyone.